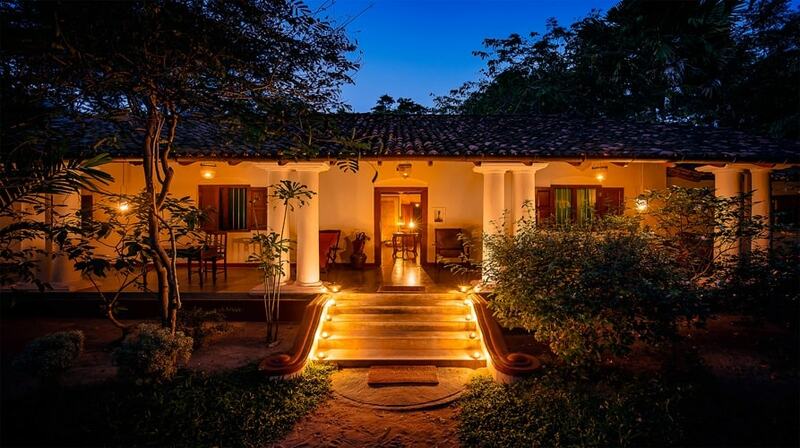 Ulpotha is an admirably remote organic farm and eco village at the foot of the Galgiriyawa mountains in central Sri Lanka that offers yoga holidays, ayurveda retreats, digital detoxing and total relaxation. At the heart of the estate is a silky-smooth, other-worldly lake for bathing in, and guests stay in adobe huts dotted among 22 acres of forest scattered with jungle flowers and teeming with monkeys, reptiles, birds and insects. This is a rare, true antidote to modern living. Read all about ayurveda here. 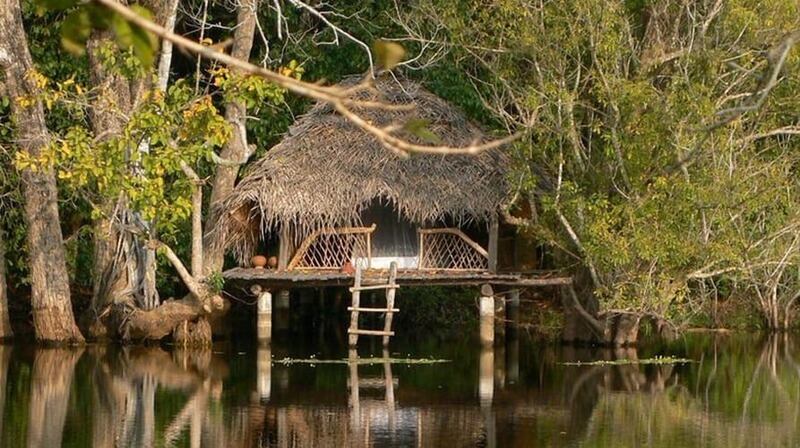 The rural simplicity of living without electricity in mud huts, eating locally-grown organic food and immersing yourself in the natural beauty of the Sri Lankan jungle and village life is a rare and precious experience. 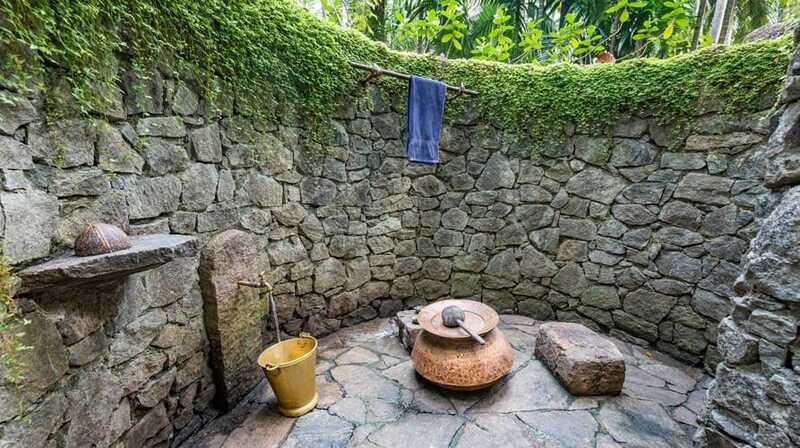 Ulpotha is fashioned on a traditional local village where bathing is a communal activity. As such showers are shared rather than ensuite. Water is also cold, with hot water only available at the Ayurvedic centre, though many find the cool showers refreshing in the soupy heat. Ulpotha is a true escape where you can mix yoga, ayurveda treatments and a digital detox with real time out in nature. Ulpotha recruits expert international yoga teachers to lead the twice-daily classes throughout their season. All levels of yogi are welcome, and it’s recommended you plan to go for the full two weeks. If you can only make one week, you must have some basic yoga experience. Note you don’t have to do yoga if you come here – one repeat guest has been coming for years and has never been to a class. Each teacher has their own unique style, but most of them teach a version of vinyasa flow. Teachers vary each year, but Vinyasa flow teachers James Demaria (from Ibiza) and Mika de Brito (from Paris) lead a retreat every year, as does yoga therapy and acroyoga teacher Melissa Smith (from Canada). See the Calendar for the full programme. You can have ad hoc Ayurveda treatments or undertake a full programme of Ayurveda lasting from 3 days (for ‘Happiness’) right up to 28 days (for ‘Redemption’). 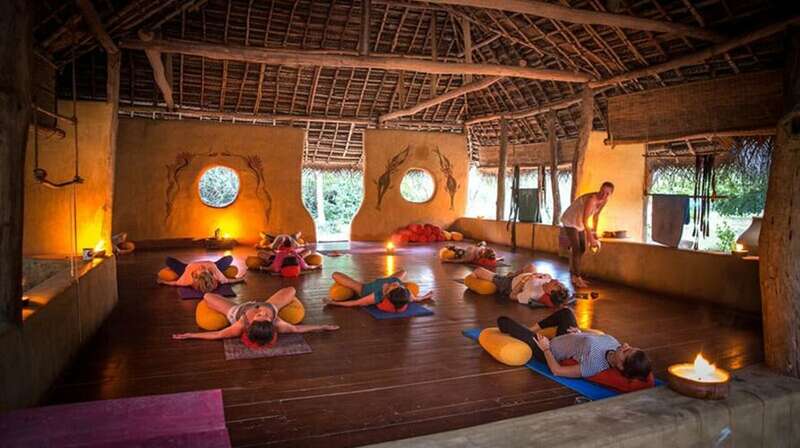 Many guests on the yoga holidays do a full two-week Panchakarma (detoxification programme) alongside their yoga sessions. All ayurveda is overseen by Dr Srilal Mudunkothge, who has worked at Ulpotha for 12 years. During your initial consultation he will ask you questions about your general health and lifestyle, take your pulse, diagnose your ‘dosha’ (body type), offer you diet and lifestyle recommendations and suggest a personalised Ayurvedic programme or a one-off treatment. A wide range of holistic massages and other therapies are on offer from visiting therapists during your stay at Ulpotha, including Traditional Thai massage, foot reflexology, deep tissue bodywork and relaxing coconut oil massages. One treatment is complimentary each week, and you can add more massages at an additional cost. A mile from the nearest road and circled by mountains where monks still live in remote temples and caves, Ulpotha is a wonderful place for a total digital detox where all the influences of our technological age are absent. There are no glaring screens or newspapers, mobile phone reception is patchy so everyone switches off, and there are safes in each hut for you to hide phones and tablets away from temptation if you need. There’s also no electricity, bar one electric socket for charging phones if you absolutely must in the main house. 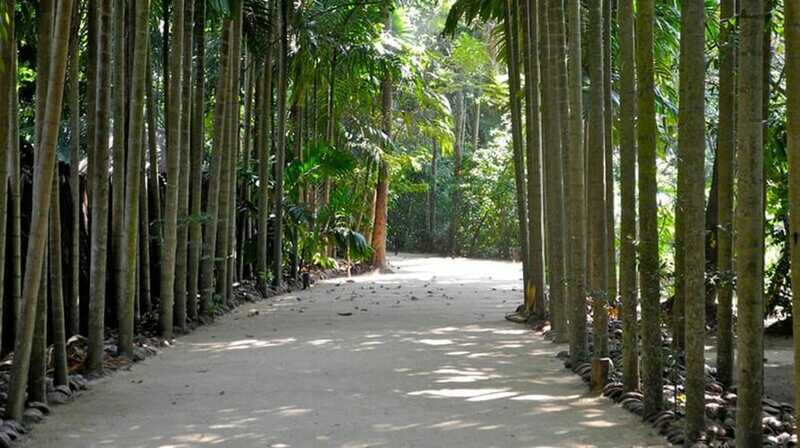 What’s left is simply the beauty of the jungle, the hospitality of the Sri Lankan people and total peace. Observing the gentle, unhurried rhythm of nature here is an excellent way to calm and soothe an overactive mind, and at Ulpotha you can enjoy wild nature at its best, for during the 32 weeks of the year when it’s closed to outsiders the village is given time to revert to its natural state. Macaque and langur monkeys are prolific, and watching them hop and scramble from tree to tree becomes a daily delight. Buffalos roam in the surrounding paddy fields. Lizards, frogs and the occasional snake can be found if you keep your eyes peeled. Chipmunks scamper around the outskirts of the beautifully decorated main house. Choirs of frogs sing to you as you lie in bed. If you’re nervous around wildlife, you may find the experience rather intense! You can also go walking, climbing or bird watching in the nearby mountains, and if most guests wish, a trip to a nearby sleepy beach on the west coast where you can go out in boats viewing dolphins and whales can be arranged. There are inspirational ancient treasures and sacred places to visit from Ulpotha, including the ancient rock fortress of Sigiria, one of the main sites in Sri Lanka; the Golden Temple of Dambulla, the largest and best preserved cave temple in Sri Lanka; Yapahuwa, the hilltop remains of a 13th century kingdom; Arankale, a 2000 year old forest hermitage; Ras Vehera, a 40ft-high standing Buddha; and Nagala, which has a temple overseen by a monk who is also an Ayurvedic doctor and a 50ft-long reclining Buddha. During a fortnight stay there is usually a half day excursion in the first week and a full day excursion in the second week taking in one or more of these sites. You can also borrow a bike at any time and cycle to the nearest village. There’s a friendly, communal house party vibe at Ulpotha, and whilst solitude is never far away for those who want, it’s also possible to make some firm new friends, for fellow guests are usually an interesting mix of people in the arts, media and professions, many travelling alone. Guests are also sometimes invited to witness seasonal gatherings at the splendid renovated manor house on the estate. Most of the villagers are Buddhists, but shamanism is still an integral part of life in rural Sri Lanka, and on our visit we watched a shaman offering the first rice harvest to the local gods, with sarong-clad men chanting around an altar covered in coconut flowers and incense and drumming filling the nighttime air. 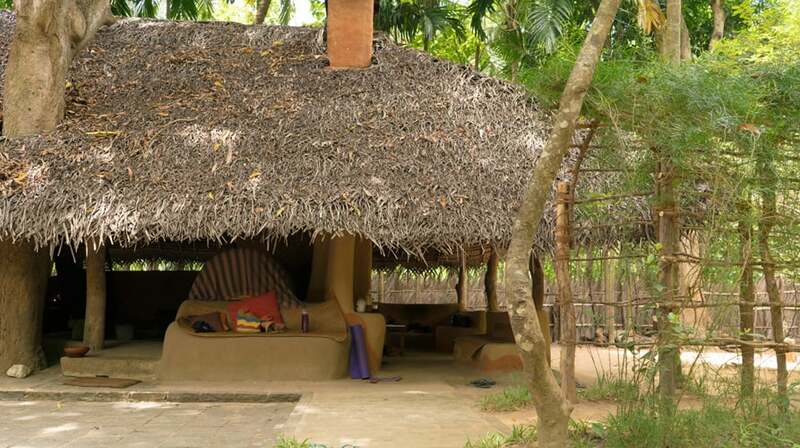 Friends Viren Perera and Giles Scott bought the Ulpotha land in 1994 as a jungle hideout for weekend parties with their friends – it only became a yoga retreat by chance when Giles met a teacher at a party and invited him to host a holiday among the then newly built huts. Occasionally and if the mood is right, Giles gets the party vibe going again, most especially at Christmas and New Year. Bedrooms: Guests stay in simply stylish mud huts with roofs made of woven palm leaves that are slightly elevated from the ground but essentially open to nature. Just one wall and drop-down bamboo blinds covering the other three sides ensure the wind provides an effective natural cooling system (though noisy lovers and snorers beware, sounds do travel between huts). Fall asleep to a choir of frogs, and wake to see brilliant red hibiscus flowers and stark green paddy fields from your pillow. All huts have one bedroom with twin beds (except one, which is triple) and though you could pay for one all to yourself, we found the presence of a companion comforting, for there is no ‘front door’ and a sense that the tiny mosquito net around your bed is the only thing between you and the great outdoors of the Sri Lankan jungle! If you’re travelling alone, the team carefully pairs people up. Each hut has a small built-in cupboard for clothes, baskets for smaller items, colourful floor cushions, a low table and no mirrors, which we found refreshing fitting for such a ‘back to nature’ experience. Bowls of floating flowers and a clay pot with fresh drinking water and a coconut shell cup are replenished daily. At night, your light comes from glowing oil lamps. Bathrooms: Communal open-air (cold) showers are discreetly hidden by palm screens, and numerous, immaculately clean toilets fragranced with joss sticks are shared. Please note, hot water is only available at the Ayurvedic centre. 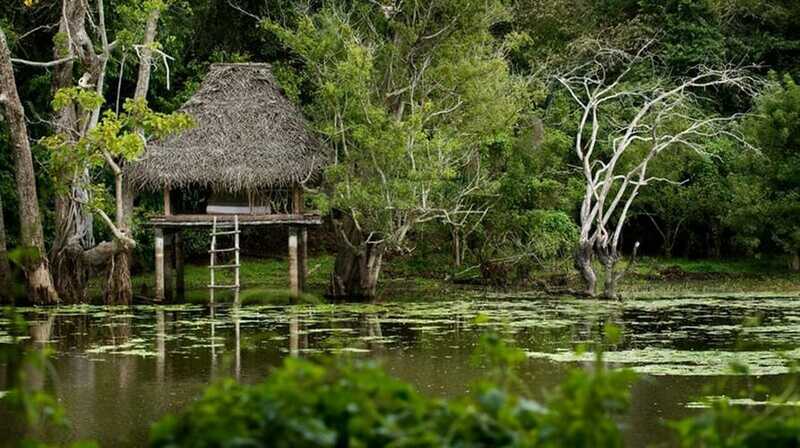 Private houses: You can also experience a night alone in a tree-house suspended up a wooden ladder 40 feet above the ground and overlooking the lake or in a wonderfully remote hut on stilts in the lake, only accessed by a rowing boat. 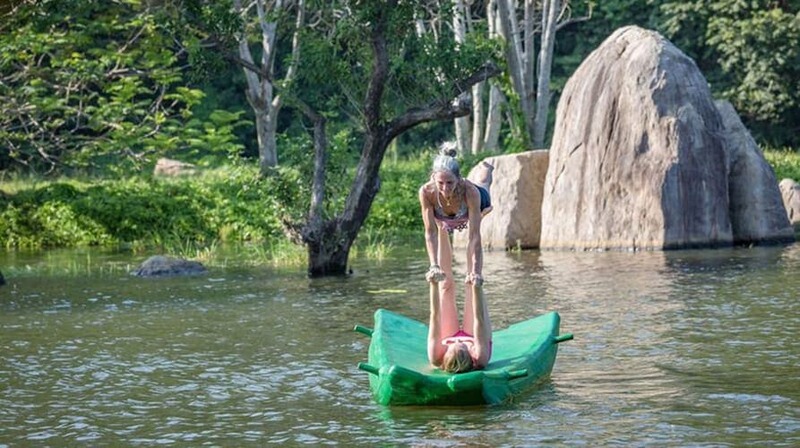 Other nooks: While yoga sessions and meals are communal, guests tend to use the post-lunch period as an opportunity to just be with nature and absorb its healing properties, ambling along the forest paths, hanging out on a hammock or swimming and boating in the silky smooth lake. Pack light, for storage is limited. 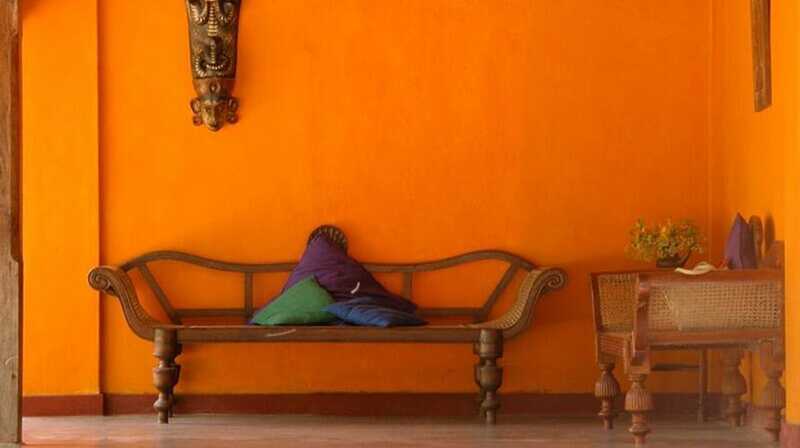 Yoga equipment, towels and sarongs are provided. Bring plenty of insect repellent, and binoculars if you’re into spotting wildlife. Bring a powerful torch with spare batteries. The walk from the main house back to the huts after dinner is very dark, and the sounds of the jungle can be a little spooky! You’ll also need the torch to light the way if you need to use the bathroom in the middle of the night. Children are welcome, though there are no specific activities or facilities for them. During both the Summer season (June to August) and the Winter season (November to March) the weather is hot and the group holidays coincide with the end of the rainy season, though the summer months can be slightly wet. Christmas and New Year is a time for celebration at Ulpotha and very popular, so book ahead to avoid disappointment or avoid this period if you’re looking for a quiet escape. You can’t book solo rooms during this time. The lake: At the heart of the estate is an ancient, other-worldly tanque (lake) built more than 1,000 years ago and fed by spring water where you can swim among the water lilies and watch yellow butterflies dance above you and kingfishers and kites swoop from tree to tree. The yoga shala: Yoga usually takes place in the large and open yoga shala with teak wood floors bordering a small lake, but one evening you might trek as we did right up to the top of one of the hills surrounding the Ulpotha lake and practiced some gentle yoga and meditation with a breathtaking view of the village and surrounding forest as the sun begins to set. 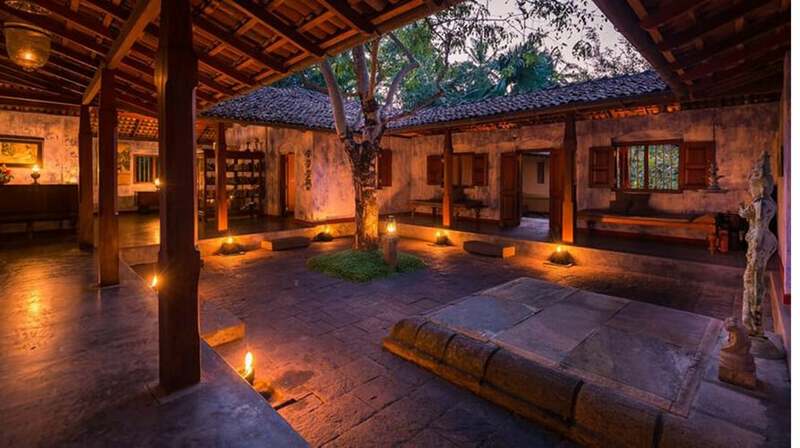 The Ayurveda village: All Ayurveda treatments take place in a beautiful Ayurvedic village of tiny thatched huts which include a shrine hut decorated with Buddhist iconography, a massage and therapy room, sauna, steam room and herbal baths, and the doctor’s consultation hut adorned with his qualifications. Meals at Ulpotha are laid-back and social affairs and a great opportunity to connect with other guests and share stories. Breakfast and snacks are served in the ‘Kade hut’ (‘roadside cafe’ in Sinhalese), while lunch and dinner are eaten communally about 1pm and 730pm each day in a beautiful, spacious Ambalama hut (‘traveller’s rest’ in Sinhalese), an outdoor room where you can sprawl on giant cushions and serve yourself from a myriad of beautifully presented dishes laid out on a huge mat of woven palm leaves. The food is fresh, sumptuous, lovingly prepared and so well loved that the estate has its produced its own cook book at the request of guests. It’s mainly vegan, although buffalo curd with treacle is sometimes served after lunch. Breakfast includes local bananas, tasty Sri Lankan nibbles and soups, while lunches and suppers feature heritage red rice from the surrounding paddy fields with inventive salads, sambols and lightly spiced Sri Lankan vegetable dishes, all using ingredients grown in the local garden and cooked in terracotta pots on open fires. 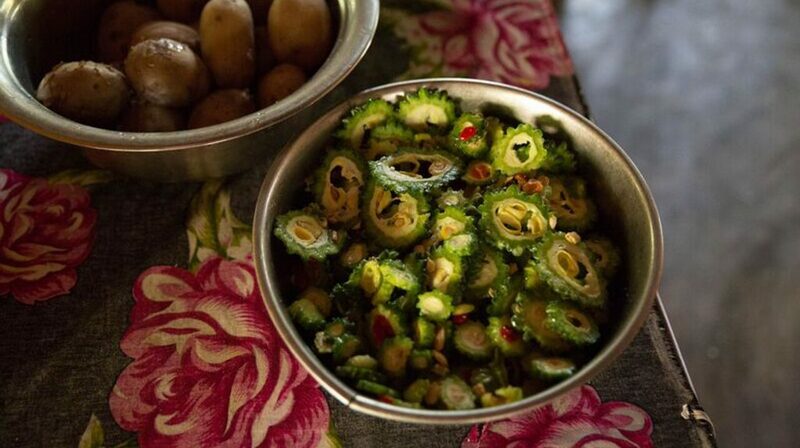 Delicious local snacks and Tambilis (king coconuts) are available in the afternoons. 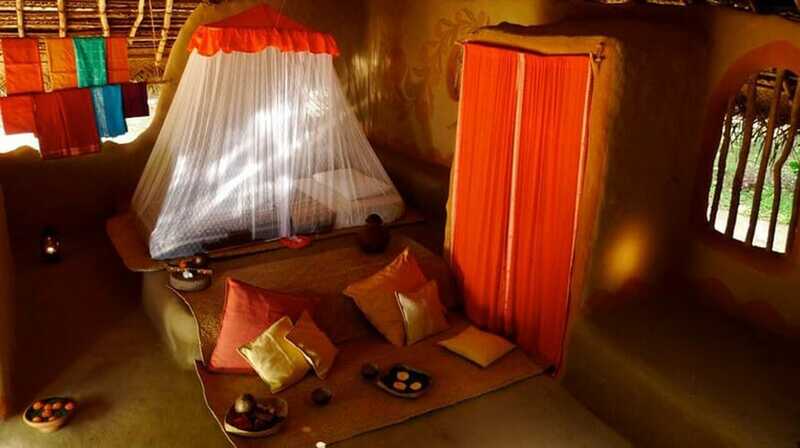 Drinks include fresh fruit juices (watermelon, tamarind and lime, apple, hibiscus flower) and ginger tea. Ulpotha does not generally provide alcohol – though occasionally there is a party with the villagers where beer and local array is available. If you’re here to simply relax and not on a detox programme, guests are free to bring their own alcohol should they wish. 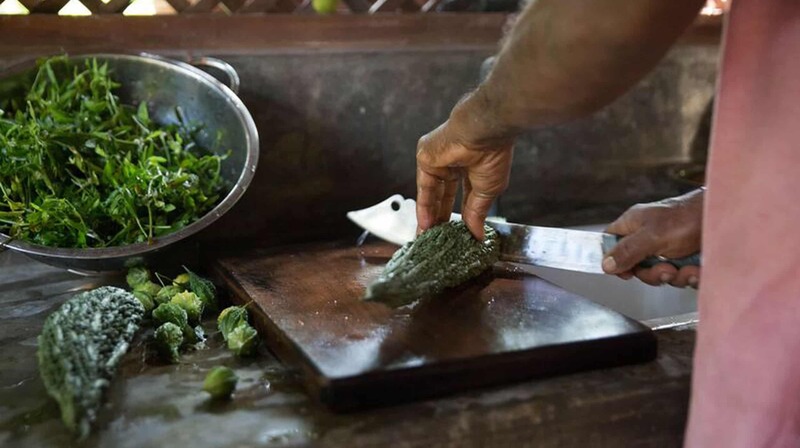 Ulpotha is an impressively sustainable organic farm and eco-village that runs a free Ayurvedic clinic for the local community, so Western guests who visit are supporting a worthwhile venture. The doctor’s reputation draws people from miles around, and some travel all night to be first in the queue. Unusually, the whole estate is run by a committee of six villagers, who make all the decisions about finances, staffing and supplies too. 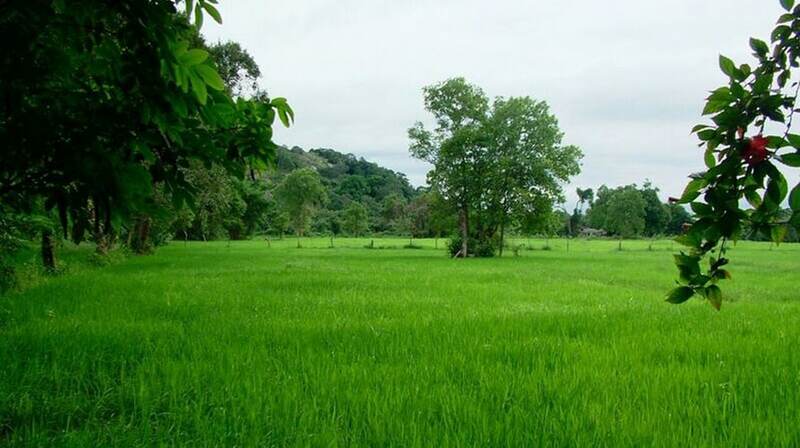 No plastic is used here, and the owners are passionate about water conservation and traditional farming methods. The main staple – organic red rice – derives from almost forgotten varieties of heritage heirloom rices that the founders have collected from different parts of the island and propegated into sufficient amounts so they can offer the seeds free to farmers who are willing to grow it organically.